Steve Schwartzman brought up the subject of galls in his recent blog post of an Oak Gall. Most often they are just a plain lump or roundish growth found on a leaf or stem. Many species of plants are gall hosts which most often are caused by an insect looking for a safe structure for its young to develop. This usually happens early in the growth cycle of the plant and develops as a result, most often, of injection of some chemical from the adult or larva. Often the larva will consume some of the interior structure as it grows toward adulthood. While most galls are fairly plain in shape and coloration, others can be colorful and interesting. I have not photographed many, but one day while hiking at High Ledges I noticed these Wool Sower galls on s small White Oak sapling along the Waterthrush Trail. Wool Sowers are Cynipidae or Gall Wasps. Bugguide does not have an image of this wasp Callirhytis seminator, but they look similar to these. This entry was posted in Animal Behavior, Closeup Photography, Insect Behavior, macro photography, Massachusetts Audubon, Nature Photography, Patterns in Nature, Western Massachusetts and tagged Callirhytis seminator, gall wasps, galls, High Ledges, Hymenoptera, Insect Behavior, oak galls, western massachusetts, Wool Sower gall, wool sower gall wasp. Bookmark the permalink. So much for my assumption that all galls are divided into brown and green. This is beautiful. I can see how it got its name, too. Those look for all the world like someone’s knitting group got together to make caps for babies in the hospital, or pompoms for big people’s caps. I discovered that these galls can be pulled apart to reveal the seed-like structures that contain developing wasps. That would be fun. Nature is just full of surprises, eh? I thought about the pulling, which goes against my philosophy, and also wondered why no one seems to have done so on BugGuide since, unlike me, they mostly have no qualms about sticking needles in bugs…after a stay in a killing jar. My mother used to knit caps with the pompoms for my brother and me, but I would always remove them. Now it wouldn’t bother me as I can live with my lack of “cool”, but all my toques are pompomless. Beautiful Steve, I’m, very much, enjoying the educational aspect of your blog! I am trying to share a little more information rather than just post pictures and attempt humor, Faith. I am glad you are enjoying them. Those are pretty. Nice discovery. If I were a wasp, I’d be proud to shack up in that. They are quite neat structures and I was stopped in my tracks, literally, when I first saw them. At the time I had no idea what they were. I visited the last link to explore other species of wasp that make galls. I realized I had seen several other examples of galls in the wild and didn’t know it. 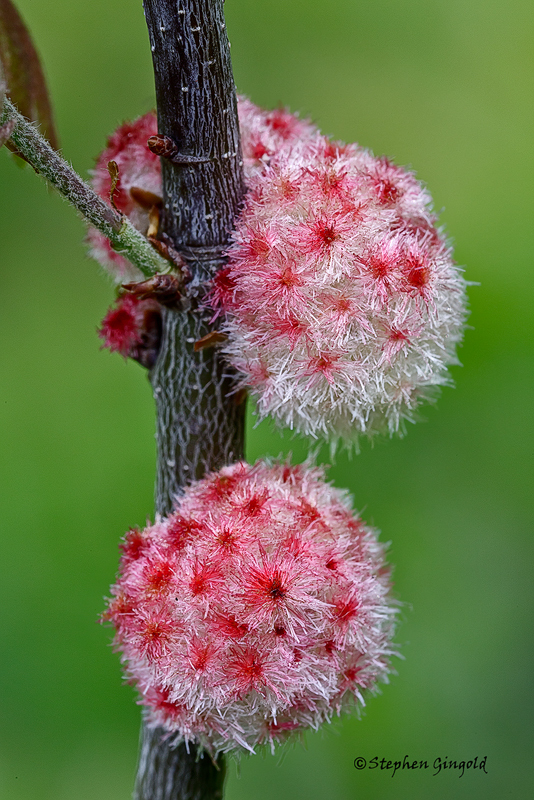 That’s an excellent picture of a type of gall that’s unusually attractive due to both its colors and its woolly texture. The neutral green background is especially appropriate to bring out the red. I saw another that had some red and a bit of soft fiber on BG.N’s site, but this is definitely the prize winner in my eye. There is an Oak Apple gall that is very colorful also and is red and green. I’ve seen a couple here but haven’t photographed one yet. Here’s one by someone else. Wow, that is a surprise. I have never heard anyone say or seen it in writing…Christmas Gall. If I had heard the phrase out of context, I would have guessed it to be a rather negative description of someone’s seasonal behavior. Twice I’ve heard Filipinas pronounce challa using an English ch sound, and I’ve had to explain that the Hebrew/Yiddish sound transcribed as ch is properly pronounced with the sound of a Spanish j.
I remember a December episode in the old television show Thirty-Something in which the mixed-religion couple had a Christmas tree and a menorah. We’ve always done that too. When we bought our home, Mary Beth found a very nice menorah. We also have a 3 foot artificial tree that she decorates. Next year maybe you can put some real galls on the Christmas tree and pass them off as Christmas galls. Somehow I don’t think that would fly despite Mary Beth enjoying nature as she does. Terrific photos Steve. Completely new to me and I want one! I am also intrigued at the Waterthrush trail. I looked up WT and discovered it is a warbler! What a swizz. Are they common there? Any pics? You need to dress in full camo, Steve and hide yourself close to the bird’s territory. Then tape-lure one in. A piece of cake! I have a friend who does that sans camo using iBird and her iPhone, Andrew. It’s a successful strategy although controversial. I think luring is ok outside the breeding season Steve. It is easy to see if the bird is getting overly agitated, which is clearly a no-no. But many birds are simply curious and have always responded to pishing. Recorded calls is just another step along that road. I agree, Andrew. The controversy comes in when the subject of baiting is argued. I read a Zen proverb the other day that both explains and leaves us to continue questioning, David. “No snowflake falls in the wrong place”. We generally believe that everything in evolution happens for a reason as you describe in questioning why the fluffy colorful exterior. Possibly there is something we are not seeing in nature that this would mimic to confuse a predator or there is something about the exterior that would discourage entry by a parasite. Or maybe it just developed to look as it does much as the snowflake lands in the right spot. Amazing~even a gall can be gorgeous! Yep. There’s beauty in everything and everywhere if we just look. I had no idea that there was that much variation in galls. The Wool Sower galls are actually pretty with interesting color. It’s always rewarding as well as informative to get in to a subject deeper. The world is filled with marvel. Steve, somehow I did not get back to commenting. I find the woolly one and the apple gall very pretty. We have galls here but not anything that is remotely pretty and interesting. The galls here are round and apple green but I think they are cute. I see them on the oak trees and some years galls appear in large numbers. I am not sure if I have heard cute and gall in the same sentence before, Yvonne. But it works for me. 🙂 I imagine that galls, as do most organisms, have boom and bust years depending on their numbers and environmental conditions. Just amazing Steve. I’ve never seen anything like it. There is always something new under the sun, Rod. I am glad I had the opportunity to show you something new.